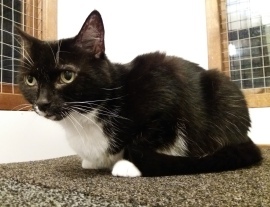 Esme is a large handsome female, about seven or eight years old. When she came to us, she was very nervous, even growling when we approached. She has now learned that we are not a threat, and she has warmed to us. She comes up to us, and rubs round our legs, and if we sit down, she is happy to climb into a lap. Her new owner may have to be patient with her at first, but she will learn to trust and then be affectionate. She needs a home with a patient adult or adults, and no other pets.